Texas and six other states couldn’t have asked for a more fortunate judge appointment in their legal quest to end DACA, the program started by the Obama administration that granted lawful presence to some 800,000 illegal aliens. 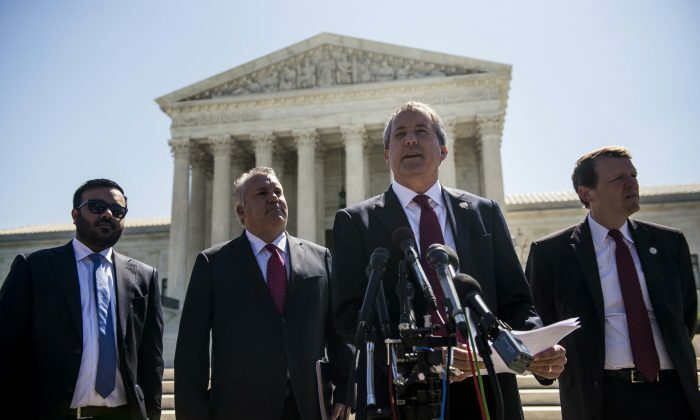 Texas Attorney General Ken Paxton filed a lawsuit against Deferred Action for Childhood Arrivals (DACA) in a U.S. District Court in Brownsville on Tuesday, May 1, and by random draw, Judge Andrew Hanen has been picked to hear the case. As it happens, Hanen previously ruled that DAPA and expanded DACA, another Obama-era program set to broaden the original DACA, was unconstitutional—a ruling ultimately confirmed by the Supreme Court. What’s more, Hanen was infuriated by the government lawyers defending DAPA, who he said repeatedly lied to him. DACA was put in place by then-President Barack Obama’s Department of Homeland Security (DHS) in 2012 through a memo to immigration enforcement agencies. It bestows lawful status on illegal aliens under 31 years of age who have been in the country at least five years, arrived when under 16, and haven’t committed multiple misdemeanors or worse. Their status needs to be renewed every two years and provides for a work permit and other benefits, such as income tax credits. While DACA itself has never been challenged in court, Hanen’s ruling on DAPA and expanded DACA makes arguments mirroring a chief criticism of the original DACA—that the Obama administration rewrote the laws to grant legal status to people it was tasked by law to deport. “The DHS Secretary is not just rewriting the laws; he’s creating them from scratch,” Hanen wrote at the time. But Hanen cut off that line of reasoning. “The DHS cannot reasonably claim that, under a general delegation to establish enforcement policies, it can establish a blanket policy of non-enforcement that also awards legal presence and benefits to otherwise removable aliens,” he wrote. This time, the government is expected to agree with Hanen, since President Donald Trump already issued an Executive Order to phase out DACA. His order, however, was put on hold by a California court in January and scrapped by a DC court on April 24. The Texas lawsuit doesn’t target Trump’s order, but DACA itself. If successful, the states ask for the government to stop accepting new applications and renewals, effectively phasing out DACA in two years. The other states joining the lawsuit are Alabama, Arkansas, Louisiana, Nebraska, South Carolina, and West Virginia. Trump has expressed multiple times his willingness to work with Congress, both Republicans and Democrats, on a legislation that would resolve the situation of illegal aliens brought to the country as children. But he’s said that he would only back an option that would also fully fund his plan to build a wall along the southern border, tighten limits on legal immigration, and end the visa lottery that grants green cards to applicants from countries with low immigrant flows to the United States. That option was rejected in the Senate 39-60, with 14 Republicans voting against it.